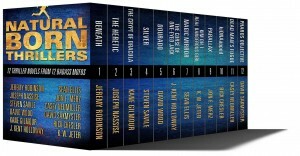 I had the honor of being included in a bundle deal, Natural Born Thrillers, with some excellent authors. I really feel like the little kid at the adults’ table here, but go pick up this deal for the so-low-you-stole-it price of $0.99 on Amazon! BENEATH by Jeremy Robinson – the bestselling, parsec award nominated, sci-fi thriller that takes a crew of astronauts and scientists to Europa, the sixth moon of Jupiter, in search of life beneath the ice. THE HERETIC by Joseph Nassise – the first book in the bestselling Templar Chronicles series, where modern Templar knights battle supernatural threats and enemies. THE CRYPT OF DRACULA by Kane Gilmour – For too long, evil has slumbered. But now, the prince of darkness has arisen…and he thirsts. SILVER by Steven Savile – the first book in the international bestselling series pits the Ogmios team against a terrorist organization calling itself the Disciples of Judas. History, religion and conspiracies collide in this explosive thriller. DOURADO by David Wood – In book one of the bestselling Dane Maddock Adventures series, the search for a sunken ship sends Dane Maddock on a search for the sword of Goliath. THE CURSE OF ONE-EYED JACK by J. Kent Holloway – An FBI analyst begins an investigation into the disappearance of her brother. The trail leads her to a dark, dangerous parcel of Appalachian wilderness where even darker things lurk…including a man named Ezekiel Crane. MAGIC MIRROR by Sean Ellis – It begins with a mysterious disappearance…it will end with the world on the brink of destruction. What will be revealed? KIM OH 1: REAL DANGEROUS GIRL by K. W. Jeter – You know you’re having a bad day at work, when partnering with a psychotic hitman to kill your boss is your best career move. PARALLAX by Jon F. Merz – a Mafia hitman and a former terrorist with a psychic connection embark on a cat-and-mouse game with huge stakes on the streets of Boston. KIDNAPPED by Rick Chesler – A priceless biotechnology, an FBI agent, and an unspeakable act of familial betrayal collide in a Hawaiian kidnapping more twisted than a DNA double helix. DEAD MAN’S FUGUE by yours truly – A man is resurrected by his life insurance policy to find the criminal underworld and law enforcement alike are after his head…but he doesn’t remember why. PHAROS OBJECTIVE by David Sakmyster – A legendary treasure chamber beneath the ancient Pharos Lighthouse has defied discovery for over two thousand years…Until a team of psychic archaeologists dare the impossible.